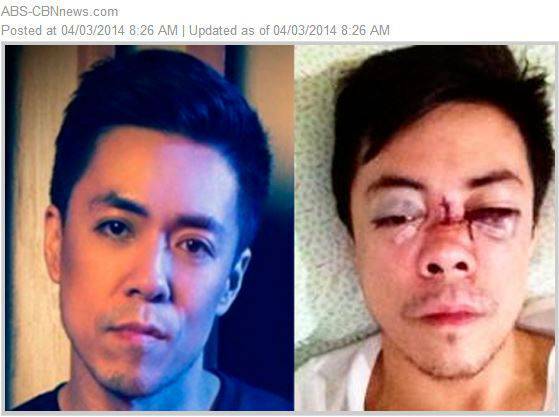 Last March 19, an 80-pound barbell fell on him Lance Raymndo’s face. "The person who was assisting him on his workout accidentally dislodged the barbell on top of Lance’s face when he leaned forward," explained the singer’s mom, Nina Zaldua-Raymundo. Raymundo’s nose got crushed. Various bones in his face also got crushed. He will have to undergo reconstructive surgery so he’ll look like himself again. Now, two weeks after the incident, Raymundo told Umagang Kay Ganda that he would still go back to the gym after his face is fixed. He also said, "Naayos na nila yung buong casing ng skull ko. Yung ilong ko na lang wala pang buto so medyo temporary pa itong ilong ko. After that, I'm back to normal (They’ve fixed the casitng of my skull. My nose currently has no bones so it’s still temporary. After they fix my nose, I’m back to normal)." Meanwhile, we’re dying to know the name of the gym where Raymundo’s face got pulverized. We pretty sure we won’t be as good-natured as he is if this happened to us.